We tend to think that whatever water falls on our lawn and garden will also get down to the roots of our trees and shrubs, but in many cases that’s simply not true. Tree and shrub roots go down much deeper than lawn roots, and if you have compacted or clay soil your soil is most likely going to be too dry (or too wet in some cases) for healthy plant growth. When soil is compacted, there is no oxygen in the root zone. The soil is tight instead of porous so water or rain cannot penetrate down to the sub-surface. 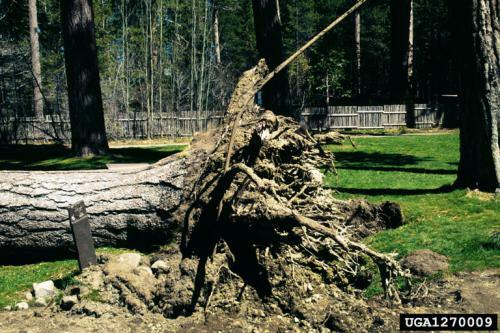 As a result, trees will send their feeder roots close to the surface, often competing with grass for space and water. These feeder roots are microscopic but can become very dense, which creates more of a water barrier near the surface of the soil. Trees and shrubs growing in compacted soils are under constant stress, and never achieve their full potential. Obvious signs of this stress are poor growth, fewer flowers, disease, abundance of non-beneficial insects, leaf drop, and dying plants. Many tree and landscape companies offer special drainage or sub-surface watering devices (at great cost) as a way to get water to go deeper. Some companies even offer soil remediation: digging out the existing soil around the tree roots and replacing it with a more porous medium that is well aerated, and allows easy water penetration. But are these costly solutions really the only way to have healthy trees and shrubs? Like the soil in your lawn, the soil around trees and shrubs needs good aeration and drainage. It also benefits from the addition of organic matter and micronutrients. The easiest way we know of to improve soil aeration is by applying our liquid soil conditioner, Aerify PLUS, regularly around your trees and shrubs. Start with a heavy application, about 4 oz per 500 sf of root area, and then do monthly applications at 2 oz. If you are already applying Aerify PLUS to your lawn, just double up around the trees and shrubs for a few initial applications, then treat the shrubs and trees well whenever you apply Aerify PLUS to your lawn. Whenever possible, maintain a mulch layer of 2-3 inches or more of organic material (compost, shredded bark, wood chips etc.) around the whole root or drip zone of your plants. This organic matter will help keep the soil surface soft and permeable, and will encourage earthworms- nature’s best soil aerators. As always, if you have any questions please email us at info@natureslawn.com and we would be happy to help!